express talks to Auckland Pride Board members about the meaning behind their #OurMarch outfits. 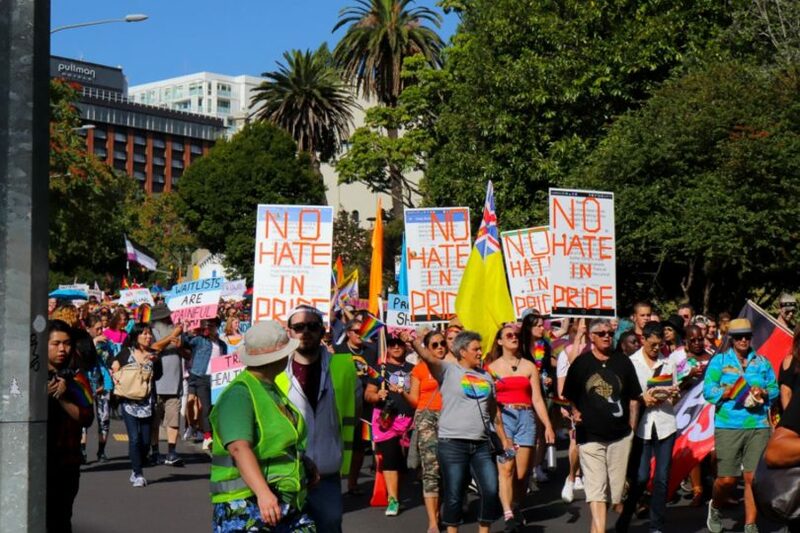 The ‘attacks’ Lett is referring to are the social media messages and emails sent not only to Auckland Pride as an organisation but to individual board members, following the announcement that NZ Police would no longer be marching. The messages left board members feeling bullied and targeted but #OurMarch gave them an opportunity to reflect their hurt back at those who had contacted them. Lett created signs for the board members and their allies to hold during the march, that displayed some of the angry social media messages board members had received, complete with profile pictures and social media handles of those who had sent them. 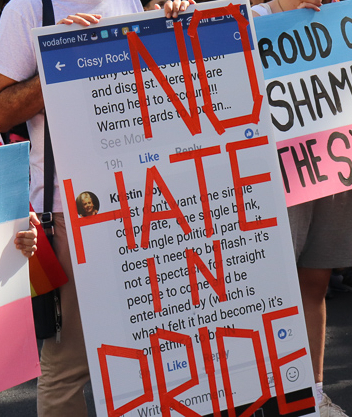 Over the top of these messages, Lett had taped over ‘NO HATE IN PRIDE’. “One thing as a board member we have faced is the incredibly vicious dialogue that’s been happening on Facebook and I just wanted to highlight some of the nastiness and turn it around and say ‘No Hate In Pride’.” He explains. Auckland Pride Board Chair Cissy Rock hopes the message has gotten through and that the community can come together as a united front. “It’s important that we all try to look forward and try to understand each other, rather than seek to be understood.” She tells express.